Alana Beard launches the shot, with 2 seconds remaining, over Maya Moore to put in the game-winning bucket for the Sparks. Photo by David Sherman/NBAE Getty Images. Minneapolis, Minn. – Alana Beard’s stat line will show only four points scored, but it was the last two that proved to be the most crucial for her Los Angeles Sparks in Sunday’s WNBA Finals Game 1. 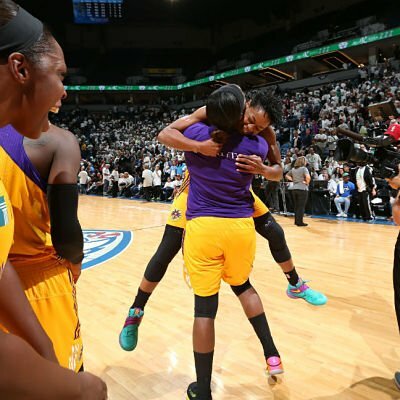 Tied with the Minnesota Lynx at 76 with 24 seconds remaining, Sparks guard Chelsea Gray ran out the clock and dished it to the veteran Beard on the right wing. 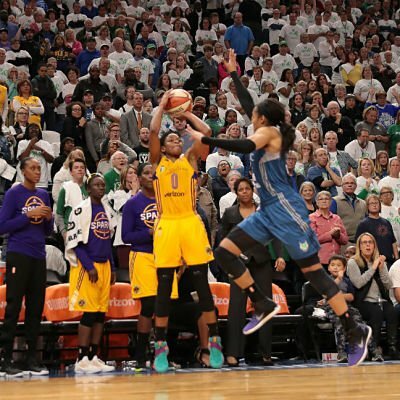 At the two second mark, Beard launched a shot over Lynx forward Maya Moore’s outstretched hand, and the ball sailed through the net just before time expired. Final score: 78-76. 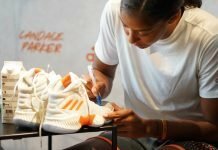 Nneka Ogwumike and Kristi Toliver lead the offensive attack for Los Angeles with 19 points each, while Candace Parker and Gray added 14 and 12 points, respectively. 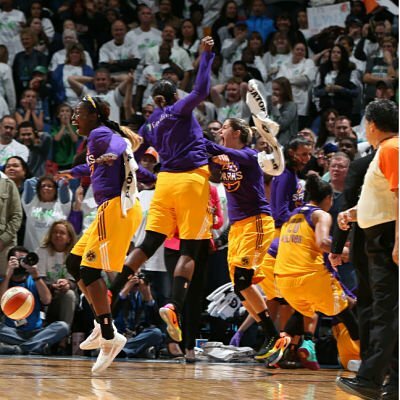 The Sparks bench erupts after Alana Beard’s shot sailed through the net. Photo by David Sherman/NBAE Getty Images. Beard said that with time running down, she didn’t have to think twice about shooting the game winner. It was the first game-winner for Beard in her pro career, but she was quick to say that it was the play that lead up to the game’s final seconds that lead to the result. 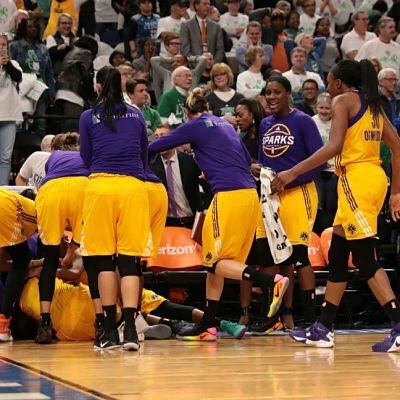 Alana Beard lays on the floor amidst the pandemonium following her shot. Photo by David Sherman/NBAE Getty Images. The game lived up to its potential, as the league’s top two teams battled back and forth from buzzer to buzzer. There were 19 ties and 10 lead changes, and neither team lead by more than five points. Defense was the drum beat for the Sparks, who forced the Lynx into a lot of turnovers in the first half, in particular, and held Moore scoreless until the third quarter. 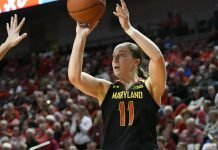 Beard was key in that defense, and her efforts down the stretch set up the opportunity for her final shot, as she blocked Minnesota guard Lindsay Whalen and forced a Moore possession. 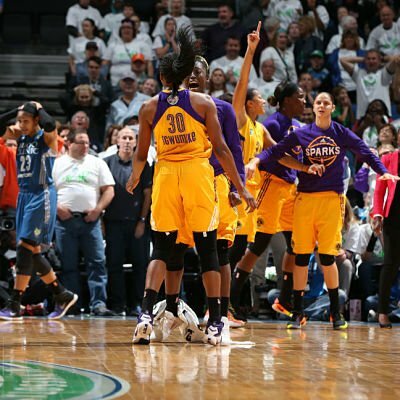 Sparks players continue to exalt while Lynx forward Maya Moore, left, absorbs the loss. Photo by David Sherman/NBAE Getty Images. Sparks coach Brian Agler noted Beard’s intangibles, which don’t always show up in the box score. 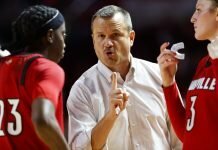 Moore, Sylvia Fowles and Lindsay Whalen each had 18 points for Minnesota. Lynx coach Cheryl Reeve credited the intensity and passion of Los Angeles throughout the game. Jantel Lavender hugs Alana Beard after the win. Photo by David Sherman/NBAE Getty Images. The game served as a microcosm of the 2016 season for both teams, who both began the season taking turns tying the league record for most wins to begin a year. Each also handed the other their first losses of the season on their own home courts. Last year Minnesota dropped the first game of the Finals series, and came back to win their third title. Whalen said the team is keeping Sunday’s loss in perspective. The second game of the series continues at Target Center Tuesday at 5 p.m. Pacific/8 p.m. Eastern on ESPN2.